• List something in seconds, as effortlessly as taking a photo. 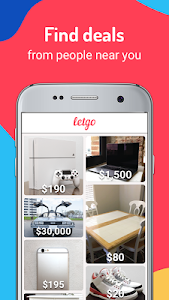 letgo's the only app with advanced technology that automatically titles and categorizes your listing, whether you’re selling a new pair of sneakers or your old car! **NEW** Buying a new car or selling your car? We’ve made it even easier to buy and sell used cars, SUVs, trucks, motorcycles and other vehicles. 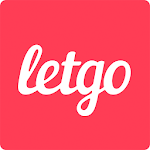 Find your dream car on letgo - at a fraction of the price! This app uses the original sound "Level Up 01" of the user "rhodesmas" onfreesound.org (https://freesound.org/people/rhodesmas/sounds/320655/)with a Creative Commons license under the Attribution 3.0 Unported terms (http://creativecommons.org/licenses/by/3.0/). 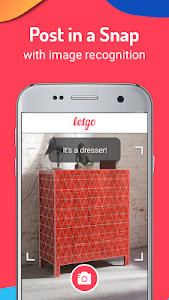 - Introducing letgo Reveal: Simply point your camera at your stuff to see what similar items are selling for on letgo. Tap to list and we'll fill in the details. 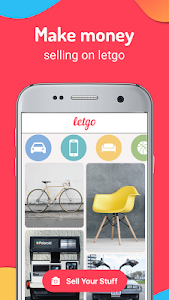 Similar to "letgo: Buy & Sell Used Stuff, Cars & Real Estate"